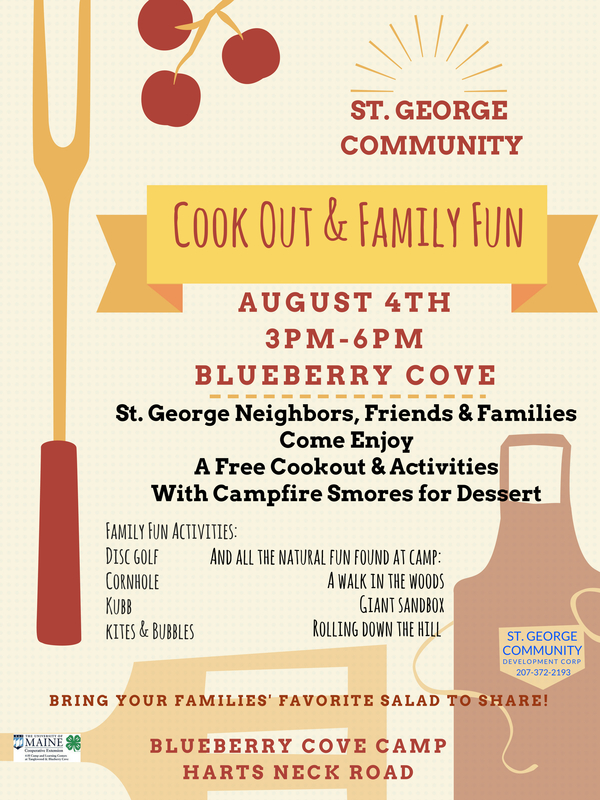 The St. George Community Development Corporation partnered with Blueberry Cove Camp for the first annual Community Cookout. The cookout was strictly about developing community connections and getting neighbors sitting and chatting with neighbors. 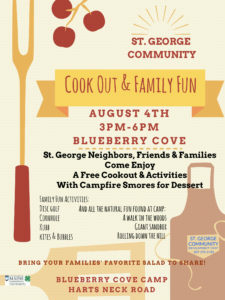 The Community Development Corporation covered the cost of all food for this event and our gracious hosts at Blueberry Cove donated the use of their facility. Community Members brought picnic salads to share and the tables filled up fast with delicious variety. Katherine Paulsen prepared pulled pork, some barbeque and some plain, while Jason Matthews grilled up some hot dogs and veggie dogs. Everything turned out amazing. We had about 100 community members come through to eat during the 3-hour event. Many of these were new faces and every one of them was smiling!